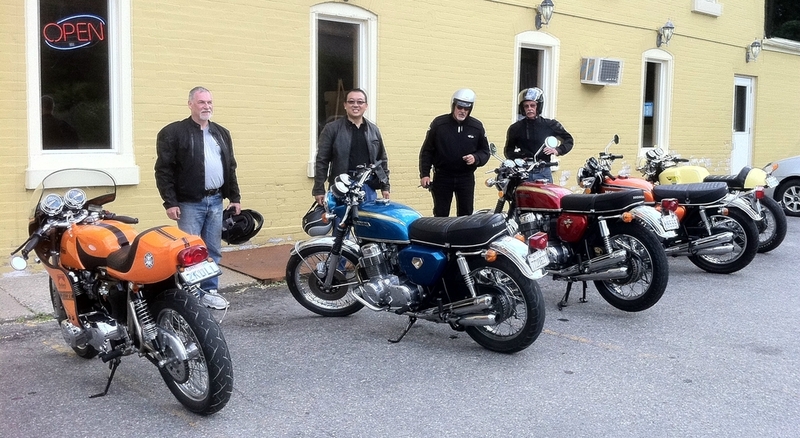 Chris, Ed, Myself, and Fred….with a gaggle of lovely Honda CB750’s ….life is good! Soichiro Honda must have been looking down and smiling. This year the CVMG’s Paris Rally featured his landmark super bike, the CB750 single-cam. I always make a point of attending Paris for the swap meet, usually just for the day on Saturday, but for me this year was something special, so I just had to camp out and take in the whole experience. Thanks to my fellow CVMG member Ed Liu for providing luxury accommodations in his state of the art bike-trailer-motor-home. I brought my 1972 Red CB750 and Ed chose his beautiful Rickman Honda CB750 so we were set for the weekend. Our camping neighbors also brought a gaggle of CB750’s along for the celebration. Chris Laidlaw and his son Harry brought a lovely blue 1969 CB750 and a nicely done CB750 Café Racer. Their third amigo Fred Green brought his beautifully restored 1972 Sunrise Orange 750 as well. In addition we were later joined by our new friend John Dymond on his freshly restored 1969 CB750….first ride finished just in time for Paris! The stage was set for a fabulous weekend and Soichiro must have put in a good word with the big boss, because the weather was perfect. 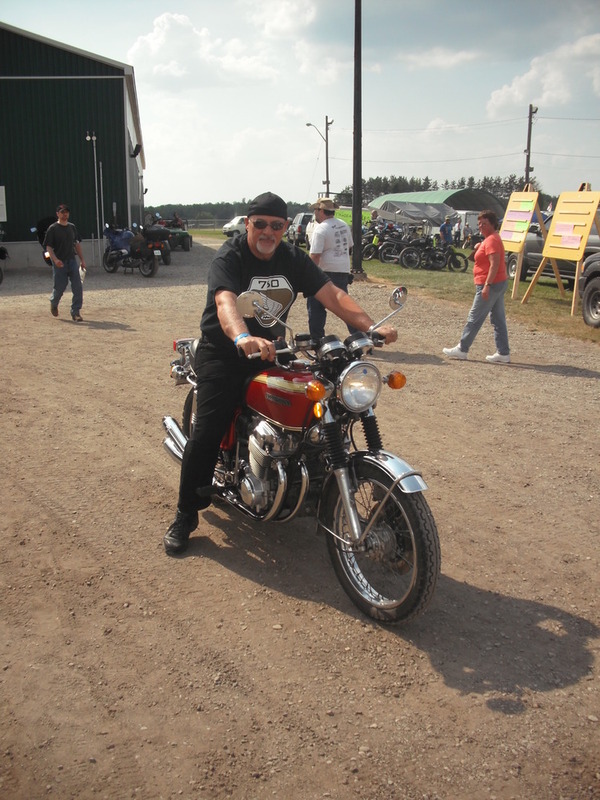 Our gang of Honda Fours blasted out on the Trillium run on Saturday and then entered our bikes in the Concours on Sunday. When the dust settled at the end of the rally Ed’s Rickman won Best Street Special, and Fred’s 1972 won Judges Choice. In addition, Chris’s door prize was the beautiful dry mounted Rally Poster signed by the artist, coincidently picturing his exact bike. Heck even I won a t-shirt! The entire rally was a wonderful experience and a few of our members even managed to bring home new bikes. Chris’s son Harry purchased a Honda 70 trail bike, and Ed scooped a very nice Ducati 450 single Café Racer. For me it was a little bit of Honda CB750 nirvana. Many thanks to all the volunteers and CVMG people that made it all happen. All in all, it was a fabulous weekend with great bikes, good friends, and wonderful weather. No Canadian motorcyclist could ask for anything more!